ACCA vs CPA (USA): Which is Better for Your Career? » ACCA vs CPA (USA): Which Is Better for Your Career? If you are an accountant and are working towards a prestigious qualification, CPA (Certified Public Accountant) and ACCA (Association of Chartered Certified Accountants) may come to mind. Should you go for ACCA vs CPA? Does it make sense to get both? The CPA license is granted by each of the 55 states or jurisdictions in the United States. There is no centralized body and each state has slightly different CPA exam and licensing requirements. International candidates are often confused and frustrated by the complicated application process. ACCA is based in the United Kingdom. It operates as a single entity with much simpler application process. International candidates generally consider the certification as a global brand. It is most recognized in commonwealth countries. This is probably the biggest difference when it comes to CPA vs ACCA. Candidates must have a minimum of a 4-year bachelor degree and preferably a master’s degree in order to fulfill the 150 credit hours, equivalent to 5 years in higher education. Once you are approved for the exam, you are on your own in terms of how to get prepared. The CPA exam is a “qualifying exam”, not a “program”. In a program such as ACCA and CIMA, you can get text books from the exam administrator, follow a syllabus and study accordingly. For the CPA exam, the State Board does not provide any courses or study materials. Candidates take commercial review courses on their own to prepare for the exam. The entry level is much lower – you are qualified as long as you have 3 GCSEs and 2 A Levels in 5 separate subjects including Math and English. Most high school graduates can qualify. If you have a bachelor degree in relevant subjects, you can apply for exemption on part or all of the papers at the Fundamental Level. Unlike the US CPA, once candidates are registered, ACCA takes an active role in preparing you for the exam by providing study guides and sample exam papers. They also run a database of ACCA Approved Learning Partners. There are 4 parts of the exam: Financial Accounting & Reporting (FAR), Audit & Attestation (AUD), Regulation (REG) and Business Environment & Concepts (BEC). The exam is 100% computerized consisting of multiple choice questions, task-based simulations (similar to case studies). For BEC, there is an additional section on written responses. Grading is mostly computerized including the essays. You can choose to take the 4 parts one at a time, 2 at a time or even 4 at the same time. You can sit for the exam any time (Monday to Friday / Saturday) during the first 2 months of each quarter and at any prometric centers throughout the US as well as in Japan, Brazil and 4 Middle Eastern countries. There are 14 papers divided into Fundamental Level (9 papers) and Professional Level (5 papers). Candidates can apply to waive part or all of the papers at the Fundamental Level. Some but not all papers are computerized. The exam is offered 4 times a year in more than 170 countries throughout the world. Most candidates aim to pass the CPA exam within 12 to 18 months. Those who have the time and commitment and choose to take all exam parts in one go can complete the exams within 3 to 6 months. Given the number of papers and the fact the exams are held only twice a year, candidates generally need 3 to 4 years to complete all papers and become an ACCA member. The US has reciprocal agreement with 7 accounting bodies in the world. Their members can choose to take a simplified version of the exam known as IQEX. ACCA is not among these 7 accounting bodies. ACCA is more “generous” in this regard — exemptions are granted to AICPA members for 8 papers (see below) as well as Foundations of Accountancy. You can check out the exemptions from the link here. All other candidates must take the exam in the US. Candidates can be taken in 400+ testing centers located in more than 170 countries. For those who find it hard to get a US VISA, ACCA could be a much preferred choice. How about Other Chartered Accountant vs CPA? There are different chartered accountant designations across countries and their respective comparison to the CPA license can be quite different. In general, I would say that chartered accountants are more of a country-specific or regional nature. For example, CAs from Australian, India and Pakistan are very well recognized in their respective countries. Outside of that though, their value drop considerably. If you plan to work in your own country long-term, it makes a lot of sense to go for your local chartered accountant certification. If you aspire to work abroad or in multi-national companies, then you may want to take a further look at the CPA license. The US CPA is arguably the most prestigious accounting qualification. Entry barrier is high with an equivalent of a masters’ degree together with strict working experience requirements. Because of these stricter requirements, the CPA exam itself has much fewer parts — only 4 compared to 14 papers in ACCA. There are certain jobs that can only be performed by CPA e.g. signing an audit report under US GAAP and launching a CPA firm in the US. There is a distinct advantage to get the CPA title if you can interested in public accounting in the United States or in American firms. For ACCA, the application process is much simpler and entry barrier is low. However, it takes years to complete the studies and obtain the membership. While ACCA is globally recognized, it is not as highly regarded outside of the UK and commonwealth countries. If I Must Pick… Which One Should I Go For? Since it is not possible to take advantage of the ACCA membership to get exemptions from the US CPA exam, I suggest that you target either one and not both. If you are serious about the CPA exam, check out this e-course which is absolutely free. You can also read more about this mini-course before signing up. I will send you the newsletter right away! Any chance of CPA recognising ACCA so that atleast students can sit for the CPA exams? The final level in ACCA is equivalent to a masters degree. After the second level in ACCA also you have the option of gaining a bachelors from Oxford brooks university. Since CPA requires a bachelors for entry I’m assuming that if you opt in for the bachelors in ACCA you should be able to use this for entry into CPA. But u don’t believe there are any exemptions. What I stated was more so about the bachelors being used as entry to CPA. There is an option to obtain your bachelors while doing ACCA which requires an extra bit. The bachelors is obtained from a recognized university. It’s optional. The masters was a seperate point. Maybe I should have been a bit clearer. I’m an ACCA student and I have completed 9 fundamental papers of ACCA. I have recently immigrated to the USA. What should I do for my future in the USA? I must say your r doing a great work.Congrats!!! keep going..All the very best!! Here I’m leaving my doubt. I’m an Associate member of The Institute of Cost Accountants of India (Indian CMA). Also have a 3 year program master degree in MBA-Finance. My basic degree is 3 year Bachelor of Arts-in Economics. I ve more than 6 years experience in Finance and Accounts. Am I eligible to pursue CPA? Im currently pursuing a masters degree here in the USA, and would like to sit for the CPA exam. However If I move to the UK what is a better route to take job wise..CPA or ACCA? Hi Jamie, where would you likely end up working? if I study ACCA can i find a job in USA, case i’m from Afghanistan and there is no CPA courses in our country i’m study ACCA program. Hi..I needed to know if I’ve completed my Acca ..will i get a proper job in Australia to be able to migrate there? I just got information from my uncle that there is now a relationship between ACCA full members and CPA requirement leading to the chance of using it to register for CPA. Never heard of it, but if you have a link that I can take a look, I will certainly take a closer look. In my opinion it’s not likely because their educational requirement is too different — ACCA requiring high-school level; CPA requiring master’s degree level. Thanks for the update – will amend that. Yes, the bachelor degree is the entry requirement; however, to become a licensed CPA in the United States, you need 150 hours of coursework which usually translates to 24 hours of non-introductory accounting courses and 24 business-related courses of which 3 should be in business law. The reason many people that have a CPA also have a masters degree is because they would rather earn a higher degree than take an additional 30 hours of undergraduate courses. Furthermore, you continue to say that the ACCA is like having a masters degree. While this may be true in the U.K., I highly doubt it in the rest of the world. For instance, Germany requires that Master degrees from abroad be an accredited University and that their business school is AACSB accredited. As of now, the AACSB only accredits highly regarded schools that are ranked. i.e. large state schools, Harvard, Yale, NYU, the big business schools in Germany like the Frankfurt School of Finance and Management etc. so unless, the ACCA is also an accredited University that is allowed to issue Masters degrees under AACSB, then no , it is not the same. I’m leaning towards the UK but I’m not sure. But your answer does help. I also read that I may be eligible for exemptions on the ACCA website. Thank you for providing detail information about ACCA and CPA. Here I am leaving my doubt.I’m a b.com student from India and I want to go to the USA for work.I’m planning to do ACCA after graduation because I’ll get exemptions in some papers and also I can work full time for gaining the work experience requirement for ACCA membership. But I’m afraid that will I get a very good job if I would move to the US?? If I’ll do masters along with ACCA…will that be any helpful? Thanks for your note. I have to emphasize that, even if you have a CPA license, it won’t guarantee a job in the US. Therefore, if the ultimate goal is to work in the US, I would set the goal of getting a job in a big US-based company (e.g. the Big 4) in your country, do an excellent job, and arrange for internal transfer. You can then take the CPA to enhance your credentials and hopefully the US office likes you enough to have to work on a permanent basis. If ACCA is able to open doors of working in a big US company, then go for it. I have done pre-engineering fsc.. Can I do ACCA?..Is this better for my future? don,”t be confused ,frankly if u want to be an all rounder like audit taxation accounting and finance than acca is the way and if u wanna be in industries doing management accounting than cima ,the importance wary from country to country…..can u tell me where r u from ?? Is there any receprocal agreement between Institute of Chartered Accountabts of India with any other professional Accounting Body? Hey i am currently studying acca and i wanted to know if i will be qualified to do the us cpa after i have completed my acca. Because i heard that acca is equivalent to a masters degree im not sure though. Any idea of ACCA’s recognition in India, or US CPA is better for career growth in India, I have 15+ years of experience, want one qualification for career growth, confused between ACCA and US CPA, i want to work in India only. Hi Jay, it does depend on which type of companies you plan to work in India. For local companies, I think ACCA is better because ACCA has been around (in India) longer and in general ACCA is more recognized in commonwealth countries. But if you aim to work in US companies, be it US regional office in India or a local corporation with public listing (or potential listing) in the US, they look for professionals with US GAAP knowledge and having the US CPA title is a distinct advantage. The other consideration is that ACCA takes longer even if you have the CMA exemptions. But if you don’t have a master’s degree, it may take equally long and probably more money to get qualified for CPA. Again, no need to believe what I said. A few people question why I am so negative on ACCA holders. I have nothing at all to hold against them; in fact, I believe ACCA is likely more rigorous than the CPA exam. It isn’t anything personal but people should know that in the US, ACCA is not as recognized as in India or other commonwealth countries. What I’m stating is not about putting doubt in what you have stated. While I do believe you post shows way more knowledge about CPA and the American educational system. It also highlights that there is a lot that’s not captured for persons outside of the USA. However that is understandable. What I’m simply stating is based what I have learned in my country our degrees are all 3 yr but cover the same amount of credits as a 4yr making it equivalent. So if based on what you stated, a bachelors may be sufficient for entry then there is a possibility that this persons bachelors may be sufficient. Just to state again I’m just trying to add to what you have already stated and what I have stated isn’t a fact. Hence the reason I said double check. The ACCA is not “recognized” in continental Europe. We have ACCA and CMA/CIMA members working in Europe, but they fall into one of 2 categories. 1. ACCA qualified and you transfer from your British company to a subsidiary in Germany or France. In this case you already have a job and your ACCA will get you the transfer. 2. You are European and you studied the ACCA in addition to your local qualification. The ACCA complements your local qualification and makes you more marketable to international companies in Europe. If you are not from Europe and you are not transferring to a British company in Europe, you will need a local qualificaiton such as expert comptable, BiBu, Wirtschaftspruefer, otherwise you will not find a job in accounting. Stephanie: I think your comparison is very good. In my experience the US CPA has always been seen as more prestigious than the ACCA. Usman, I respect your view, but I have to say I tend to agree with Gunner. I can see the value of ACCA in India, Pakistan and some commonwealth countries, but Europe? hmm… at least that’s not what my former colleagues in Europe told me. Nothing personal. hello, it’s grateful. I’m going to take CPA and self-study. But before application, i would like to ask where i can get the sample free exam paper for both of cpa and acca? I don’t really cover ACCA — my apologies I can’t help with that. In Canada, the accounting designation is Chartered Professional Accountants (CPA Canada). In year 2014, the three accounting bodies of Canada, namely, CA, CMA, CGA were unified under the new Chartered Professional Accountants (CPA Canada) banner. So if you would like to come to Canada, study for a while and work in Canada in future. The best suggestion is to sit for the CPA Canada exam. I will admit that both AICPA and ACCA are great accounting designations that are worth pursuing. However, if your destination is Canada, choosing a local one will be the first choice. For ACCA, I know that currently ACCA and CGA Canada has a mutual recognition agreement which will allow full member of each body to join the other. Pay attention here is that “full member” does not include student. Also, as previously mentioned that now CGA, CA and CMA are merged. There will be no guarantee that in future, the existing MOU will still work. So if you are half way in your ACCA study or just started a little bit. It would be better to consider sit for Canada CPA exams to get a Canada CPA. For AICPA, I would like to say that Ms. Ng does a wonderful works in this website. I know people from Canada can go to States to sit for US CPA UFE and it will be more economic than flying from other countries. So if you plan to study in Canada, it will also give you chance to sit for US CPA. I know that before unification of accounting bodies in Canada, if a US CPA full member from recognized US states come to Canada, he/she can sit for a reciprocity exam to become a Canada CA. Again, after unification, I am not sure the future development of this reciprocity exam pathway. hello noname.. Thank you soooo much for your answer. you certainly explained it in detail. In one sentence you even said that if you want to come to Canada….. it kinda implies that you also work in Canada I guess so you must be very much aware of the whole cpa Canada process. But as we can see the eligibility criteria and experience requirements are very confusing in Cpa Canada as compared to acca. And as I said I will be studying accounting studies in my two year post graduate diploma course there so I think i can qualify for one of the eligibility criteria of entering Cpa C.
But as far as acca is concerned I am li’l confused to go for it coz the subjects I will be studying in acca, more or less are similar to the ones that i’ll be studying in my accounting studies course. So I don’t know how would the certification help me otherwise with my diploma coz any interviewer might ask me that what was the purpose of studying the similar subjects again? So please help me out here. ACCA or US CMA or CPA CANADA?.which one would help me the most if I think of having a combination of subjects which would look more versatile and should justify my resume and make sense to the interviewer specially? I am not surprised that you will be a little bit confused when you refer to the website as there will be tons of information delivered which will be relevant to various guest visitors. Then in this page, click “Becoming a CPA”, then three panes will shows, click “Getting Started”, then you will go to another page which will list out requirements for entrance. (1) PREP: just read the page above and you will know, generally speaking, it is for someone who wants to pursue the designation, but somehow lack of certain contents, for example, with a non-accounting degree, with an international degree, etc. (2) PEP: this is for student who has either passed PREP or based on his/her previous education, experience, etc, exempted from PREP. In this stage, you may need to write 6 exams (Core 1 and 2) plus 2 exams (Elective1 and 2) plus 2 learning modules (Capstone 1 and 2) and a final three days exams to complete your exam part. (3) Working for another 36 months (I am not sure about the length) to get your designation. As you can see that obtaining Canada CPA is not easy. So again, it may be better to consider your future development before making a decision to sit for those variety of accounting designations’ exams. If you are in India, why not take the India CA? Based on my knowledge India CA is a very prestigious designation and subject to highest standards. Then try to obtain a US CPA in future to add more value if your future job exposure will cover more US clients. If you plan to come and settle in North America, Canada CPA and US CPA will be a must have as one dealing with IFRS and the other dealing with U.S. GAAP. When the topic changes to ACCA, I think ACCA is also a great accounting designation and in Asia Pacific, Europe and other common wealth countries lots of people pursue ACCA. Back to old days, ACCA exam is based on paper and I am not sure whether they have computerized-test now. Like Canada CPA, you will get tons of technical memo, calculation schedules and reports to write before you can pass. For US CPA, it has to be admitted that except USA, it seems all other countries now are using IFRSs or like standards. So that particular characteristic make US CPA more valuable. Like it said, before you can watch the game, buy ticket first, right? However, the most difficult part of US CPA is that a lots of States are one tier so it may mean the US CPA title and licensure being deemed to be one possession before you can write CPA after your name. Passing exam without license just like you paid the price but the ticket sold out. Maybe I am wrong here as I am not an expert in this. On your last point, Noname, you are exactly right. Passing the exam without getting the license has little value these days. This is one of the most important points I try to tell everyone on this site. anyway back to the topic.. As you said, Yes Indian CA is prestigious qualification but I am not going to stay here for long so would not be able to complete it. As it requires you to go through firstly CPA then ipcc group 1 and group 2 then 3 years of article-ship under a CA then one has to crack a main exam!! ofcourse mostly accounting qualifications require the similar process so it does not make much difference if i consider to get a CA or ACCA. But as we can see Canada cpa has a lot of processes which requires you to invest your time and a lot of money so now I’ll decide between acca or US cma. As its a very important decision and should be taken evaluating all the factors to avoid a long term mess! So if i decide on going for US cma i’ll get gleim’s review material for self study and if i decide on acca then i ‘ll think of kaplan or bpp study media. 1 suggestion no name should have a name here so that we could connect with you further. 🙂 cheers! I know my comments are long and if you feel there is some distraction from the topic in this page. Pls let me know. Just like you I am also not that kind of expertise in such a broad topic. I think people who shows interests in Canada CPA should contact respective accounting body to obtain detailed information. Due to each people will has a unique education background and prior experience so establishing contacts with regional body and telling them your story may smooth the application process. It looks like Canada CPA does not require a master degree to enter into the exam. I am wondering if a guy with a master degree in accounting to apply, will there be any exemption from those exams? Anyway the more people know you the more they can deliver. Extremely sorry to discuss about some other qualification as this blog is meant for the discussion of only acca vs cpa(US) courses. apology for the inconvinience. I read your reply and I think the CMA you referred to is not CIMA UK but CMA US. I suggest you read Stephanie’s blog that compare the two. I am wondering have you already owned a bachelor degree now? As I recall that you mentioned diploma 2 year something before. If not, per the above link it seems you will not satisfy the education requirement of CMA US. At the other hand, it seems CIMA UK does not require a bachelor degree to get started. Based on my knowledge, CIMA exam from UK is very challenging, interesting and commendable. Why not taking CIMA? Yes I do hold a bachelors degree in business administration. And as I have gone through the course content I came to know that ACCA, it is well rounded and also includes parts of Management Acconting. CIMA mostly focuses on Management Acconting. ACCA covers Law, Tax, Performance Measurement, Corporate Reporting, Auditing, Corporate Governance, Business Analysis and so much more in depth studies as you go towards the final papers. It would surely give an entrepreneur a broader perspective of business as I plan to start a startup business someday. I have to admit I am a little bit confused as if you hold a bachelor degree (is it a four year 120 credit hours one? ), why you mentioned that you will go for a 2 year diploma in Canada next year? Based on the brief introduction provided by you, I strongly suggest you to get AICPA exams (i.e. U.S.CPA exams) done asap. It looks like you have a bachelor degree as well as a master degree (if the “MA” refers to Master) and with two degrees it may be easier to qualify for the 150 credit hours education rule by AICPA. Although I know ACCA (Association of Chartered Certified Accountants, UK) is a commendable accounting designation, however, based on my knowledge, it is not broadly recognized in the States. I don’t understand what “ACCA skill module” stands for, however, I understand that you have committed lots of times and efforts in it. While really appreciating your hard works, I still think placing AICPA in first priority is a smarter choice as AICPA is the only locally recognized accounting designation in States. And If I am not wrong, I think ACCA exams will not test U.S. TAX and business laws and regulation like AICPA. However, U.S. Taxation & regulation is a must-have if you try to enter into accounting & assurance professional in States. Thank you in advance ? Thank you so much ma’am ? If you are in the final stage, get the CA first. I know India CA is actually the most difficult accounting designation in the world and achieving India CA can make yourself proud as well as make you a real professional. If your goal is to work and settle in States, Acca is not recommended as the locally recognized accounting designations in States, unfortunately, do not include Acca. A must-have if you want to boost your career in North America in a long run. Also a Uscpa may get a chance to write a reciprocity exam to obtain Canada CPA if you have obtained your Uscpa (I mean a licensed public accountant (not a successful exams writer) in recognized US State boards by Canada CPA) before you become a permanent resident of Canada. It is necessary as the requirement of USCPA exams and subsequent license application requires 150 credit hours (detailed requirements for accounting hours and business hours can be found in individual state’s accounting board website or in this wonderful web blog) which usually cannot be achieved by a single bachelor degree. However, choosing a correct master program is another complex question. Saying that is because I am not familiar with detailed rules regarding the credentials evaluation. Assuming someone takes 2 years to get an accounting master but later it turns out that credits obtained from this program is not recognized by particular state board. How to deal with that? I don’t know. However I am thinking a research over this topic may help someone to make the best use of the not yet started master program. No one can guarantee a job to nobody, it doesnt matter what kind of excellent designations you have. However, experience with a locally recognized designation may be considered as an asset by a local employer. Hi I am currently doing ACCA in Nepal. I have completed 4 of my fundamental papers. I am very much interested to study in US. I completed my A levels and and doing ACCA now. So my main issue is how can I pursue my remaining papers in US? how can I apply? can I continue my remaining papers after I come in US? Do I have to do other bachelor’s programme also there? If yes, then there is no point for me in moving there? If you are already an ACCA affiliate why you still need to know the exemption granted by ACCA for USCPA? If you try to obtain exam exemption for USCPA by using the ACCA designation you owned, unfortunately I have not heard of there are any exam exemption for ACCA holders to write USCPA exam. I strongly suggest you to navigate to the front page of this web blog and read Ms. NG’s other publications regarding what is Uscpa? How to obtain Uscpa? For Austrilia CPA and Canada CPA, it is most desirable for people who works or plan to work in those countries. I heard of that Austrilia CPA may can be pursued outside Austrillia, but Canada CPA most probably can only be attempted in Canada. If you plan to work in a particular country, say country A, then get a country A locally recognized accounting designation is the first priority. I am 38 yeear old. I have done M.com from India. After that I have worked with aCA in India for a year. I have also workedwitha CPA in the US for a year. Its been 4 years since I stopped working. I have forgotten everything whatall I learnt when I was working. I was never career conscious but now I want to build my career. I dont know where to start from. I was thinking of doing ACCA. do u think it will help to get a good job. I am all confused!!!! Start working witha CA again for a year to ger some knowledge and experience. N thentryin MNCs. After that apply for Acca. I want to go for some professional course that can help me to get a good salary. I know I cant do CA. Its way too hard to get thru. Which course would you suggest. I have no plans of settling outside India. Would prefer to go to another country for 2-3 yrs. Divya all depends on how soon you want to clear and how well you prepare for the exams, CPA can be cleared in minimum 3-6 months depending on the preparation and performance in exams. on the other hand i feel the centre for appearing is making a lot of difference as middle east pass % is around 20% while for US its around 50. I would like to know what do u mean by 4 year bachelor s degree .. I have my b com degree in correspondence in the prestigious university- University of Madras .. Then I do posses a professional qualification -Chartered Accountant of India .. Now am I eligible to appear for this exam .. Please kindly find a solution for me … And guide me the way to appear for this course ..
i am in sheer confusion as to which course should i choose to complete at the earliest. CPA / CFA / CMA as i want to to get qualified for any one of the at the earliest and i am really ready to put into my best, i am already a Chartered Accountant in INDIA. i can finance myself for only one of the course at a time. rest i would expect my job after qualifying to support me. If i opt for CPA i would have to run from pillar to posts for getting a US Visa (Where pass% is 50+), while on the other had i have a option to appear in DUBAI as well (where the Pass% is around 20%) so what should be my best option and choice. hope someone would be able to guide me. hey i am right pursuing ca from india and i have cleared my ipcc group1 nd group2 is pending…i m planning to do cpa from usa…but my question is whether it is valuable in india? will i get good job opportunites? Sir, Acca or cpa which is more toughf?? Both are pretty tough in their own ways. CPA covers very wide while ACCA usually goes deeper. Thank you so much for putting So much effort and work on this! We really appreciate your time and help! I have a situation and need your input. I have done my BCOm from Pakistan and completed 3 papers of ACca before I moved to US. Now I am in US and I am confused what to do next? My transcprints have been evaluated and I am given Associate of arts equivalency. What should I pursue to be CPA? My goal is to be US CPA. How much long do I have to study before I be one!? I have work experience of 3 years in finance if they can help somewhere.. Thank you to eveyone in this forum for their contribution! Hi Somebody, nice to see you here! If budget isn’t an issue, I suggest you find a US university that would accept you transferring in the BCOM credits, then take more classes to graduate with a 4-year degree in the US. This would help you qualify for the exam, as well as helping you land a job in the meantime. I am not sure how the university considers the ACCA credits but worth including those in consideration as well. I am working as a project coordinator in water treatment company veolia. Feel free to ask any follow up questions. I pass BBA (Hons) in finance last month, now i was thinking about the degrees like ACCA and CPA or even CFA too, but i am totally confused which one i should select, as we have CPA in Pakistan and its not expensive too but its not the same as CPA US is.. what should i do? can you Help? I am 19 years old and I am in the process of completing my undergraduate degree in accounting here in the US. However, I am 100% sure that I do not want to live and work in the United States. I would love to work as an accountant in Australia, Switzerland, New Zealand, or in the UK. After I complete my undergraduate degree, what would be the best path for me to take in terms of licensing and master degrees? Should I get a CPA here in the US and then apply for a work visa elsewhere? Should I get my master’s in accounting in the specific country I’d like to work in or get my masters here in the US and get licensed in a different country afterwards? Or should I take the ACCA because it applies to more countries? Does the ACCA apply to Europe and Australia as well? Thanks! Hi Brittany, thanks for your note, and interesting career plan! The thing for ACCA is that it is somewhat recognized in many countries, but it isn’t THE best one in any country (except in UK I guess), because if there is one local statutory accounting qualification, surely people would recognize that. For example, the CA/CPA in Australia, HKICPA in Hong Kong etc. So ACCA is always a “nice to have” in my opinion. It is true that US CPA could be less recognized in those countries. It’s hard to generalize because you aren’t too sure where you will be going. Having said that, if you don’t mind working in US regional offices or any local companies with a public listing in the US, they do like US CPAs. In fact, if there is such opportunity, you with the US CPA would likely get picked for interviews. Considering also that CPA is a faster track than ACCA and most other “local” qualifications, if I were you I would still go for the CPA. You can get a master’s in a foreign country, get those credits recognized through an evaluation report to fulfill the 150 hour requirement. I agree. You should get your US CPA. I have seen many job postings in Switzerland that look for CPAs. Another thing you will need for Switzerland is fluency in either German or French. If you zero in on the UK, I would recommend the ACCA. As for Australia, you should check if the Australian CPA has an agreement with the US CPA. You might be able to just apply for the Aussie CPA after you obtain your US CPA. first of all your blog is great ! your advices proved to be very useful while i was pursuing my CMA(USA).i have sucessfully completed both my cma part 1 and cma part 2. My question is i have completed CMA (USA), i hold a bachelors degree (3 yrs) and a Post graduate diploma in business managemet (2 yrs). how many papers do i get exemption in ACCA ? I am from Nigeria. I am an associate member of the Institute of Chartered Accountants of Nigeria (ICAN) since 2012. I have a degree in accounting and master in business administration. I have been working as internal auditor in a university since 2009. I am planning relocating to USA very soon. Please what is your advice for me in other to be gainfully employed as an accountant. Hi David, it will be beneficial to get the US CPA qualification in a medium term. If you work in a multinational company, you might be able to arrange an internal transfer to their US office. This would be the smoothest path I can think of. It does work for many of my friends. I’m currently working as a HEDGE FUND ACCOUNTANT and I’m planning to pursue ACCA but after I complete my FRM. 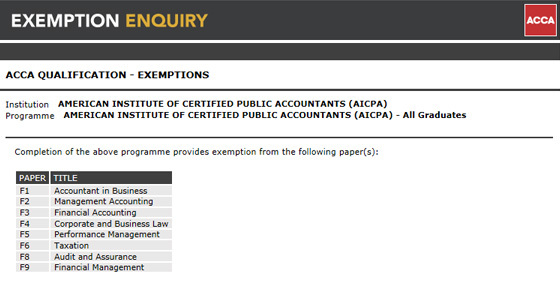 My question to you is, will I get exemptions in few papers of ACCA after clearing FRM exam? As far as the Bachelor or Master degree requirement is concerned, the ACCA has a reciprocal agreement with Oxford Brookes University for a Bachelors in Science and University of London for the MSC program. A good question to ask if the MSc would suffice for someone to sit for the CPA exam. It is also a cheaper option for a degree. Do you think that these degrees would be recognized by the US? I was looking into taking the MSC from University of London and possibly taking the CPA exam to be exempt for all but one Foundations exam. That way you can knock two certifications out along with the 150 credit requirement. What are your thoughts? It cost roughly around $5000 dollars for the Masters of Science/ACCA credential. I have a regionally accredited degree in Finance from the US. Hi Paul, I have to say that the state boards are well aware of this arrangement. They see Oxford Brookes = ACCA. In other words, if they don’t accept ACCA to be an equivalent to a US degree, they wouldn’t accept Oxford Brookes either. A few state boards do accept ACCA or OBU’s courses as educational credits towards the 150 credit hour requirement, but not necessarily recognize the whole thing as a degree. I am not sure about the Univ of London Master’s arrangement with ACCA. If you need to take extra course to get that, then it could be a different story from OBU. Now CIMA and AICPA is in the process of merging the two entities, how this would affect the future for CIMA members in Canada?? ?I m currently based in Sri Lanka and i am planning to migrate to Australia, but along with this merger i have second thoughts about changing my plans to migrate to Canada. Actually, these two entities are planning to merge the two institutes, now they are taking a poll from its members to obtain their opinion towards it. Therefore, in this background what can we expect as members of the new accounting body expect in Canadian job market? I haven’t really decided about my destination yet, My two options are Canada or Australia. I want to know which country would recognise my ACMA CGMA qualification more. Anyway, even if there is a merger between AICPA (US) and CIMA (UK), there isn’t an impact on Canadian accountants in my opinion. They have their own CPA Canada to get sorted out. Supposedly the best qualification for accountants in Canada is this new CPA Canadian qualification. For Australia, you should check out the Australian local qualification: CA Australia or to a lesser extent, CPA Australia. It’s the dream of all these associations to become THE truly global association, but in reality there isn’t one yet. AICPA and CIMA is closer to be one in general/public accounting and management accounting respectively, but both still don’t have real global coverage. I am from India and I want to ask you sir what should I do ACCA or CPA.here there are jobs for both ACCA as well as CPA. So what should I do. I don’t want to do the Indian CA of which membership is given by ICAI. In India as far as I saw, ACCA has demand only in Big 4s, and that too for freshers. I had registered for ACCA and now not sure whether to proceed with it or not, please correct me if I am wrong. But I found CPA has good scope in India, it comes almost next to CA. I’m currently studying Acca in Malaysia and I have 6 more papers to complete. Do you think I can apply a job in big four while studying? I recently started to pursue taking CPA exam and was unable to due to my 3 yr bachelors. If I wanted to understand if the MSC in Finance offered by University of London will help me qualify to sit the CPA exam, where should I start? Also what’s the best way to apply for accounting jobs? Internet application process clearly doesn’t work. I recently saw an accounting qualification calle. CFM . does anyone know any details about it ? Soon I’ll appear for my cma(usa) exam. So once I cleared it will I be eligible to pursue CPA, BECAUSE I only have a graduation degree in BCOM which is only of 3 years and I also have 1 year of work experience in big 4. I have completed cma exam part 1 n 2. I’m planning to pursue CPA. Having completed the Cma exam, will thatake the CPA exam a little easier ,. Hye.. I am an ACCA qualified . I am planning to persue CPA but I am not sure the criteria to do CPA.IS ACCA equivalent to 4 year bachelors program here in usa ?or I should go for BSc option in ACCA …is it enough for CPA ..? It’s all quite complicated so take you time to navigate through. I have completed my BCom+MCom. Currently doing my CA from ICAI and CS from ICSI. I am looking forward to work abroad. I thought to opt for CPA but the procedure is very complex for International students. Sir, I have my family relatives in US and UK as well. Will this in anyway help me to complete my CPA procedure/CPA course with ease? With comparatively less cost? Please guide me.. Appearing from US is better or other countries? Which is cost effective and comparatively simpler in process? Hi Nandani, yes, it is a very complicated process for international candidates, at least at this stage. You can save some money if you stay at your relative’s home during the exam you take the exam in the US, but otherwise, there is little help in the application process. I have recently completed all 4 parts of the CPA exams and am about to start working for one of the Big 4 in the US. I will definitely try to get the CPA license. I’m planning to work in the US for about 4 to 5 years (probably to Manager level at Big 4) and may relocate to Singapore down the road. Would you suggest I study for ACCA during my free time to facilitate my move to Singapore? Would that help me find a job or do a internal transfer within my Big 4 to Singapore more easily? As ACCA takes years to complete and I just finished my last CPA exam last month I don’t feel like hitting the books for a while haha. Hi Pham, I would go for the internal transfer route. Please do your own research, but from what I know, your US CPA is good enough for recognition in the Singapore office. If 4-5 years later you decide to stay within public accounting in Singapore for long-term, you may consider whether it is necessary to get the “default” qualification in Singapore. Hello. I am have 2 more exams to finish CPA and I was planning on becoming IFRS certified as well and was considering ACCA. Is it true that if I am CPA, I only need to take P parts and exempt of all F parts? I work for Big 4 and even though we have 99% of US GAAP clients, every once in a while we would have some IFRS related projects and I believe that USA is accepting ACCA as IFRS certification. Hi zdravko, I am not too sure how US sees ACCA in terms of IFRS certification… generally though ACCA is a pretty tough exam and very few people would do it after getting the CPA. can i find job using my ACCA in us ? or i will just waste my money and time going for ACCA ? If ACCA is useful for your career in Iran, you can still go for it. so you think it is better for me to not spend time for ACCA at the moment, and wait till i get to USA then i start for CPA from the beginning ? if yes isnt master degree the requirement of CPA ! It’s really a personal decision Shahrooz… what I am saying is that ACCA, in my opinion, is not really recognized in the US. You can do more research and see if you agree with me. I really appreciate your sincere and honest zeal for accounting,business and finance career. As far as I know,ACCA is genuinely having a bigger role in today’s society than US-CPA.Having ACCA qualification gives you several equivalence certifications about 11-13 of them including IFRS that a big carrier unlike CPA.In my opnion therefore,ACCA is global whereas CPA is ONLY us-centric qualification and I guess is typically designed to address only us financial gaps existing in us and this does not mean it has it all in one qualification. On the comment of entry requirements for ACCA against CPA,CPA requires Masters/bach of 4years….why?Appears CPA intends not to give broader technks/knowledge in accounting…just some how tackles some topics that should fundamentally have prior knowlegde to.In other words,CPA just polishes up…note while you polish the shoes,it really looks clean but does not necessarilly mean it is clean. Back to ACCA-The reason the entry level is low; I guess is because the course intends to create/build in you professional carrier whereby you are formated to being THAT! you dream to have as a career!actually digs deeper than CPA and as to why is globally recognized! However,all accounting bodies are good respective of the countries where they are of.This is because there’s nothing like “One is All” but generally what matters is career,skills and knowledge of something than qualification. Thanks Derek for your sharing. It’s very true that there isn’t really a truly global designation for accountants at this stage, although all the big guys (AICPA, ACCA, and to a lesser extent Australia CPAs) are trying to be one. Thanks alot for your great view and reprimand. Sir i completed m. Com from pakistan now what is best for me acca or cpa. I wish to pursue CPA but would like to know if it’s possible to work in london as a CPA. Hi there so I can’t say for certain in London but I can say as a former auditor from a Commonwealth country that at my firm, one of the big four, you had to have ACCA to sign off on audited Financials. I also know specifically of a manager who was never promoted further because they were cpa and not acca. That being said remember this is from a Commonwealth countries perspective I’m sure in London their is more than enough businessbusiness with US companies to warrant doing cpa. Thanks for sharing John. Yes I can see how this is the case in small commonwealth countries. It’s less likely the case in London but it would be prudent to check. HI I M pursuing CA from india. and i hv completed m.com. can i go for US-CPA? WHAT IS BEST FOR ME…… US CPA OR ACCA…? I am about to graduate school and planning to enter foreign university, A few days ago my friend gave me a bit of information about ACCA and told me that it is even more appreciated than university degree ( diploma ).. I really want to be the best at accounting. Therefore I am thinking that why i need to study at university 4 years rather than preparing for ACCA exams. Is it OK if I gain ACCA certificates and don’t study at university or should I continue the acquisition of knowledge at university? Hi Rafael, I guess it depends on where you plan to work. It is true that ACCA doesn’t require a university degree, but if you don’t have a university degree, I am not sure how difficult it is to get an accounting job these days. It is virtually impossible in where I live. Or one would get stuck in entry level position without a degree. Hi Irfan, as mentioned above, for BCOM + CA please contact Leslie-Anne Rogers. Good luck! Did you know that you can start ACCA, papers to certain papers and get a degree from them for doing a case/ research study from Oxford Broooke Uni in UK. Look at ACCA website for this. I just want to start ACCA but I am not sure about it.I am an Intetnational Management student at Budapest. And I am planning to work in one of the multinational companies.In this case according to my field from which “F” I have to start? Or what kind of opportunities can ACCA guve me in order to find a job in my field? Can it really give opportunity? I am afraid I don’t know enough about ACCA to help you on this. My knowledge is good enough for the comparison of ACCA with CPA. ACCA is common for E.Europe countries now, more popular. Also, look at CIMA, depends what type of accounting you need to do ? hello!good evening.i am from Azerbaijan.i wanna take some ACCA papers(3..f1 f3 f7) exam but maybe i will move to USA in future.if i will ,can i find job like that? i will start in this month if you have advice you can say me about acca.i means which papers is so nesessary and like that. Hi Asgar, thanks for your note. I don’t cover ACCA except as a comparison to the US CPA. As for whether ACCA is useful in the US, I have to say it is rarely recognized, as the US has its own CPA license. I need your advice for the same question (US CPA or ACCA?) ‘for my condition’. My situation: I have a masters degree in economics and I am currently working in a multinational company in Turkey and have just get the Turkey CPA. This certificate provides me an exemption for Fundamental Levels (F1 to F9) in accordance with the ACCA’s partnership contract. In other words, if I decide to get ACCA I can start from P1. On the otherhand, I am currently planning to move to EU countries. So, do you think that studying ACCA (instead of US CPA) sounds logical for me? * You know CPA can be passed in 12-18 months and ACCA needs much more time. What do you think how long will ACCA get (passing professional level)? * Also, CPA is more reputable in EU, is that right? Yes I agree that ACCA is likely more recognized in EU. But it also depends on which countries in EU — if there is a local qualification, it is definitely better. Thank you for your kind reply. You gave me a different aspect of view. I am going to research it immediately. My name is Obaidullah, I have recently finish my Bachelor degree in BBA ( Finance) which i gain 138 Credit hour, I want to purse my education in CPA. What should I do now. I am associate member of Cost accountants of india i.e qualified Indian CMA and also qualified indian CA Intermediate and not planning to complete Indian CA final, and also presently working in UAE from past 1 year and willing to continue my career in UAE or within GCC countries. hi vignesh , dear if you want to work in uae than ACCA or Aicpa both are good and equally respected by employers but ACCA has slightly an edge in uae over AICPA b/c if you are acca member u will be granted UAE CA a new local qualification which was introduced by acca and uae authorities so go for ACCA it is more widely recognized hope it helps,…. ACCA is recognised in Canada, but difficult to pass ! what are the opportunities I can have over a CPA student? First one is to take a postgraduate diploma in professional accountancy to complete the requirement of NZ CA and then start CA journey. The problem with me is that I am not comfortable with the British exams system. Second: one is to take a postgraduate diploma course in Management Information system and study for the American CPA on the same time and I will take the tests in Japan. Please help me and give me your advise. Dear Barbra, if u want to move outside uganda than go for it , it sure has recognition. I am a b.com + CA from ICAI, India. if I get a study visa for doing master’s in US. Can I sit for CPA exam sideby or the time I complete my 150 credit hours. Can a CPA can do job in corporate in any state irrespective of the state under whom it has appeared for exam ? Am in Africa,country KENYA,I want to persue ACCA,Is it offered in Kenya? can I get a good job in kenya after the completion or I have to flee to uk for a job? Hello you are doing a fab job by helping people ‘s doubt. Am I eligible for ACCA and could that lead me to some good working option in the above countries? I AM CONFUSE BETWEEN ACCA AND CPA WAT WILL BE USEFUL FOR DUBAI. THE MAIN PURPOSE OF WRITING IS CAN I GIVE EXAM FROM INDIA?? I find this website very helpful.I am CMA USA qualified and want to continue my learning process.I am planing to go for ICAEW can you please guide me what will be better as i am working in UAE and want to persue my career in Accounting and finance. just wanna ask if i did acca , am i eligible to study CPA as soon i finish this? I believe the video undervalued the ACCA a little bit when you stated that ACCA entry level is high school, while CPA entry level is bachelor degree. Because entry level is not as important as the end membership level. Also, the extra number of papers in ACCA should compensate the low entry level. i am doing acca and complete 3 paper .now i want to do my further papers in USA.so what is the possibilities to get visa?.and what is the requirment? I am from Jamaica and have a valid US visa. I don’t have a bachelors degree. I have Sixteen (16) years accounting experience. I am part ACCA qualified and is presently doing my MBA (Finance), Is there any state in the US that will allow me to take the CPA exams based on my experience and qualification? I am ACCA member and have M Com equivalence based on ACCA membership from Higher Education Commission of Pakistan. Can you please advise me that ACCA membership and M Com equivalence will meet the entry requirement, if do so I will appreciate if you please advise me State as well. Hi my name is sanjay I have completed my ACCA ,now I’m a immigrant here .what should I do to get into business as a CPA ? I fininshed my depoloma and am doin CPA from Uganda so when i finishe level four can i work in a CPA firm in USA? I fininshed my diploma and am doin CPA from Uganda so when i finishe level four can i work in a CPA firm in USA? I fininshed my diploma and am doing CPA from Uganda so when i finished level four can i work in a CPA firm in USA?